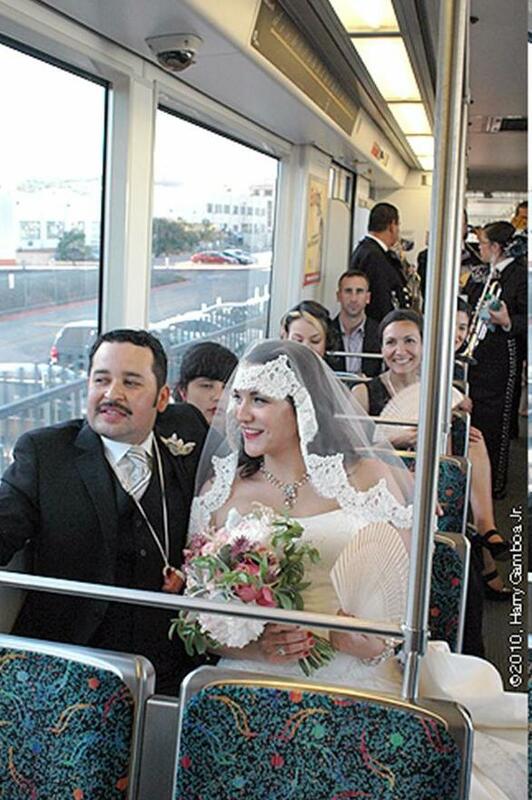 This past Saturday May 29, LaEastside’s Pachuco 3000, many Eastside artists, art administrators, and familia from LA, Juarez & Texas attended the wedding of our dear friends & curators Pilar Tompkins and Adrian Rivas. I don’t think Harry Gamboa, Jr. will mind that I’m sharing his photo showing the procession accompanied by mariachis and guests leaving the ceremony at Nuestra Señora Reina de los Angeles [Placita Olvera] to the Mariachi Plaza on the Metro Goldline. Strolling from the church through Olvera Street, the joyous couple’s first dance was to “Volver, Volver, Volver” played by one of the Placita’s scheduled bands. Tourists and locals joined in the glee of the whistle blowing guests en route to the Union Station. The perfect day included a unique 1930’s reception at the beautiful Plaza Salon, formerly a speakeasy that is within walking distance from Mariachi Plaza in Boyle Heights. Pilar & Adrian’s love of Los Angeles history, art and architecture [which was featured on Saturday] was a blessing to all that attended. Que vivan los novios! To Love & Die in East L.A.
Day of the Dead Workshops for the WHOLE familia start THIS Saturday in ELA! This entry was posted in architecture, art, boyle heights, culture, East Los, Eastside, Events, Gente, Greater Los Angeles, history, Identity, Mariachiando, Personal, stories by Victoria Delgadillo. Bookmark the permalink. Congratulations! I’m glad the train didn’t hit anyone. I saw those photos, they look pretty cool walking thru union station. But did they rent the stretch train with the tinted windows and the chrome wheels? simply awsome! felicidades a los novios. It’s sooo magical, I wish I could have gone and been part of the magic. It’s like the baddest Chicano/a wedding ever !! The Eastside social event of the season!